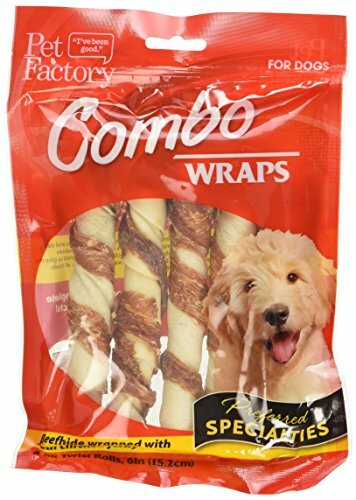 Pet Factory Rawhide Twist Rolls Wrapped with Chicken Meat Chews for Dogs (4 Pack), Medium/6"
Pet Factory Combo Wraps are handmade using traditional rawhide, pork hide, and real meat jerky, all combined in different fashions that will keep your pet's interest and provide a tasty, fun chew experience. If you have any questions about this product by Pet Factory, contact us by completing and submitting the form below. If you are looking for a specif part number, please include it with your message.